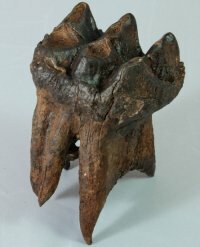 Fine Fossil Mastodon Tooth with Amazing Root Structure [EF453] : Fossils Online, Welcome! 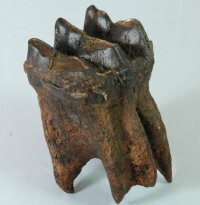 I am not sure how this tooth was able to survive with all of its roots perfectly intact. Very nice chocoalte brown color. 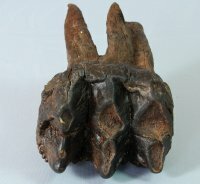 Stands on its own and would certainly make a great addition to any collection. Stands 3 1/2" tall. The chewing surface is 2 5/8" x 2 1/4". Don't miss this one because you may never see another like it again.